With so much stress and tension in our hectic lifestyle to balance, people widely suffer from under eye darkness and patches. It is observed that an improper lifestyle is also largely responsible for these problems which indirectly result in aging marks such as wrinkles, crow’s feet, dark patches and more. If you are in search of a good under eye gel to get relief from dark and puffy eyes, here are some of the best solutions available in shops and stores to help you. Made with active herbal ingredients such as cucumber, papaya, honey, nuts, mineral water and more, this eye gel from Biotique is a perfect choice for both men and women. It not only reduces eye puffiness and dark circles but also eradicate all signs of stress. Having a soothing effect on the eye, this gel is no doubt refreshing at its best. Get back your beautiful eyes with regular usage of Biotique Bio Seaweed Revitalizing Anti-fatigue Eye Gel. 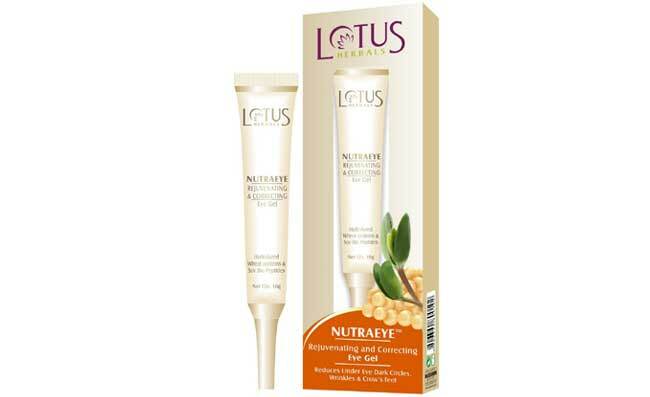 Another herbal under eye gel that is widely popular among Indian women is the Lotus Herbals Nutraeye Rejuvenating & Correcting Eye Gel. It hydrates the eye in a cool and soothing way so that the various signs of aging such as wrinkles, crow feet and dark spots get reduced effectively. Some of the prominent ingredients used in this herbal eye gel include wheat proteins, soy bio-peptides and more. Quite pocket friendly and effective at its best, this eye gel has natural components such as aloe vera, soya protein, wheat germ oil, olive oil and lots more. From fine lines wrinkles to dark circles, all signs of aging can be eradicated with help of this gel that is also proficient in reducing fine lines and pigmentation around the lids. Sparkling in appearance, this under eye gel has a smooth and soft texture that relaxes the eye properly. Made from 24 carat gold leaves along with components such as aloe vera, almonds, amla, bearberry, sandalwood, tulsi and many more, this gel helps reduce dark circles, fine lines and wrinkles in a comprehensive way. It refreshes and rejuvenates the under eye area within few days of application. Kaya is a recognized name in herbal cosmetic products in India. The under eye gel of this brand is known for its smooth and lightening properties that reduces dark circles, patches and stress marks. It also tones and adds firmness to the skin thoroughly along with dissolving blood pigments in an even manner. This organic under eye gel is equally effective in lightening dark circles and puffiness of eyes in a simple way. It also enhances the blood circulation, thus relaxing the eye muscles and pigmentation problem. With Organic Harvest under Eye Gel, you can even conceal your signs of aging within few weeks. Though this under eye gel from Shahnaz Husain is comparatively expensive than other options available in Indian market, it has excellent skin nourishment power of plant stem cells, cucumber, rose extracts and aloe vera. Apart from nourishing your eye areas deeply, it regenerates and tones the skin in an even texture. Can Fake Eyelashes Cause Eye Infection?